Elfriede Giard, Business Manager of the SGS Systems and Services Division, presented the certificates to Mukesh Goope of Hulamin Containers. 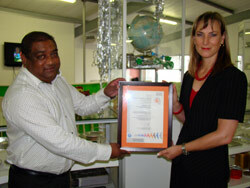 SGS recently presented Hulamin Containers with ISO 22000:2005 and PAS 223:2011 certificates, the latter being the first one to be issued by SGS South Africa. The aluminium foil food packaging company is one of some 70 clients who have obtained ISO 22000:2005 certification from SGS. ISO 22000 is designed to cover all the processes in the food chain that deal directly or indirectly with the end-product being consumed. Furthermore, it specifies the requirements for food safety management systems by incorporating all elements of Good Manufacturing Practices and HACCP, together with a comprehensive management system. This standard can be used by all organisations in the supply chain to create a harmonised food safety standard that is internationally acceptable and fosters legal compliance. The Publicly Available Specification (PAS) 223 has been developed to specifically address prerequisite programs (PRPs) of food safety for food and drink packaging design and manufacture and is intended to be used in conjunction with ISO 22000. “The fact that Hulamin Containers has already implemented these requirements and successfully achieved certification status, shows that they indeed understand the benefits that can be gained from this. In addition they can benchmark against other organisations who make quality and safe products their main aim,” says Elfriede Giard, Business Manager of the SGS Systems and Services Division. SGS is the world’s leading inspection, verification, testing and certification company. SGS is recognised as the global benchmark for quality and integrity. With more than 75 000 employees, SGS operates a network of over 1 500 offices and laboratories around the world. “The food industry is one of the key focal areas of SGS. We have a global team that specialises in developing our service offerings and expertise in this sector and with this, we would like to share that experience with our customers. In SGS we believe in building partnerships with our clients and trust that this is displayed through our services,” comments Giard.